The knee is a complex hinge joint that also allows some gliding and some rotation. Whilst the inside of the knee joint is continuous, it is divided into three compartments which are summarised in more detail below. The bones of the knee are the femur (thigh bone), tibia (shin bone) and patella (kneecap). The surfaces of these bones within the knee are coated with cartilage (articular cartilage) which is very smooth. Between the femur and tibia the medial meniscus and the lateral meniscus (a specialised form of cartilage) help to distribute load, absorb shock, stabilise the knee and aid in lubrication. 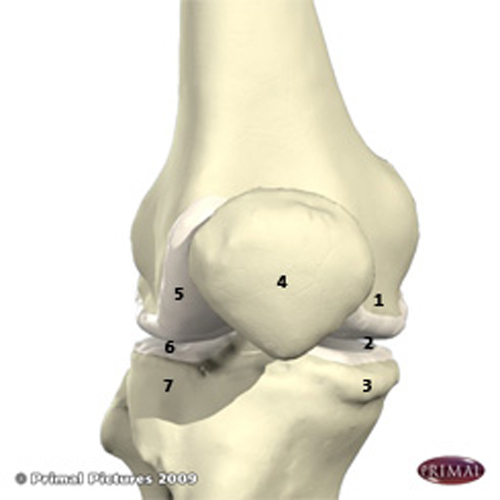 The knee joint is also lined by synovium, which produces a lubricating fluid. The knee bones are connected by strong ligaments which stabilise the knee and allow it to function properly. There are two cruciate ligaments (anterior cruciate ligament and posterior cruciate ligament) and two collateral ligaments (medial collateral ligament and lateral collateral ligament). Muscles around the knee provide movement. The muscles at the front of the thigh, the quadriceps, straighten the knee, and those at the back, the hamstrings, bend the knee. All of these factors provide smooth, stable and pain free movement of the knee joint.